Does your dog have an allergy that you want to include on her ID tag to keep her safe in case she gets away? Sadly, there’s not enough room on her current tag. PetHub tags may be a good solution for you. These tags allow you to include more information than the generic pet ID tag by connecting it with a scannable code to a web page. That way, if your pet goes missing, the person who finds your pet can be made aware of any important information and be able to contact you immediately to reunite you with your furry friend. But first, let’s find our more about how these tags work. PetHub sells ID tags, collars, accessories and more. But, the company really stands out for its digital dog tag, which is what we will be discussing primarily in this review. Using PetHub tags is easy. All you do is create a profile for your pet online, which includes the pet’s name, age, breed, medications, allergies, your contact information and other pertinent details. 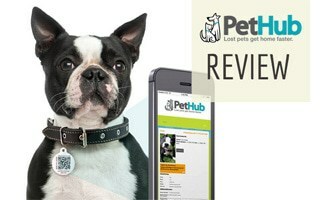 Purchase a PetHub signal tag and if your dog is ever lost, the QR code can be scanned and all of your pet’s information is provided for the person to reconnect with you and care for your dog correctly while she is away. This can be especially helpful if your dog has been injured and needs immediate vet care. The veterinarian will know your pet’s medications and allergies to better treat your pet, even if you are not there. There is no monthly fee for PetHub’s Basic Account, which includes your pet’s online profile and data storage. For a monthly fee you can receive alerts when your dog’s tag is scanned, location information, shelter alerts and partner discounts. Below is the subscription fees for PetHub’s Premium Account. Enter the code PETHUBLUV at checkout to get a 20% off your order via this link. Without an ID tag on your pet, your best friend might never find her way home. ID tags are crucial for the return of your pet. Is a QR Code Better than a Generic ID Tag? PetHub’s QR code system is not only easy to update but it provides the most current and comprehensive info to keep your set protected and safe. It may even be cheaper in the long run, especially if you move a lot. These tags can be updated as often as you need without any additional cost to you. No need to buy a new tag when you move or change phone numbers. And although we hate to think about it, if you wish, you can use this tag for another pet after one has passed away (after updating the information, of course). These tags also include much more information than the average ID tag which may just save your pet’s life. What do you think of this QR code style ID tag? Also, PetHub tags have a toll-free number on them, as well as a human readable URL, so if people don’t know how to scan a QR code, there are two other ways they can reach out the pet’s owner. Thank you so much Lorien for bringing this to our attention. Sorry for that error. I have updated our content but it may take a day or two for it to appear after caching. Thanks again!